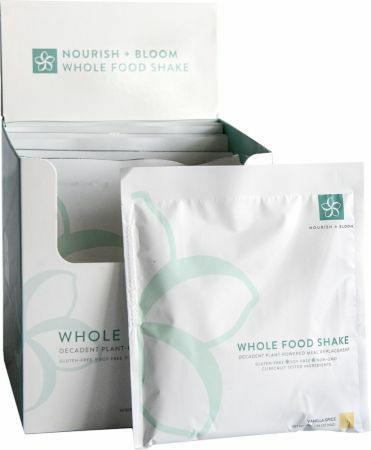 Vegan Protein blend [(pea protein isolate, rice protein concentrate, pumpkin seed protein concentrate), sprouted legume protein (organic navy, lentil & garbanzo bean), green whole leaf protein (spinach, kale)], coconut oil powder, Fiber Blend (pea fiber, oat fiber, apple fiber, flax seed), gum acacia, natural flavors, Fruit & Vegetable Blend [(red raspberry, cranberry, strawberry, carrot, blueberry, pomegranate, acai (Euterpe oleracea), blackberry, cherry, black raspberry, beet, banana, pineapple, flaxseed, mango, papaya, peach, watermelon, apple pectin, apple, pear, tomato, acerola, broccoli, orange, shitake mushroom, spinach, kale, parsley, green cabbage], guar gum, Aquamin® (seaweed derived calcium, & magnesium), (Lithothamnium calcareum), salt, Digestive Enzyme Blend (papain, glucoamylase, amylase, bromelain, fungal lipase), Natural Sweetener Blend (steviol glycosides, & rebaudioside-A), sunflower lecithin, and cinnamon bark. Mix one packet with 8-10 fl. oz. of cold water and mix well. To increase the calories and nutrient levels, use 8-10 fl. oz. of your favorite non-dairy milk or blend into a smoothie. Do not use for weight reduction. Keep out of reach of children. Do not purchase if seal is broken or missing. 25 grams of vegan protein sourced from peas, legumes, and brown rice.